Today let’s talk about eco friendly alternatives to cling film. Growing up cling film was used ubiquitously in my house (ubiquitously! ), but at some point since leaving home at the age of 17 I stopped using the stuff. I can’t remember exactly when as it has been well over a decade since I last bought cling film, but what I do know is that it was no great loss to me not having a roll to hand. Finding alternatives that worked just meant thinking a bit more creatively in the kitchen. Got some leftovers from dinner time? If the food is in a bowl I’ll cover the leftovers with a plate and pop it in the fridge for later. If the leftovers are on a plate I’ll use an upturned plate to cover the plate with. If you’re in a pickle and out of plates, then saucepan lids also make pretty good plate and bowl covers too. Pro tip! For reheating food in the microwave I simply pop a non metallic plate on top of the plate or bowl to avoid food splatters. So thrifty, so simple,and my favourite cling film alternative. 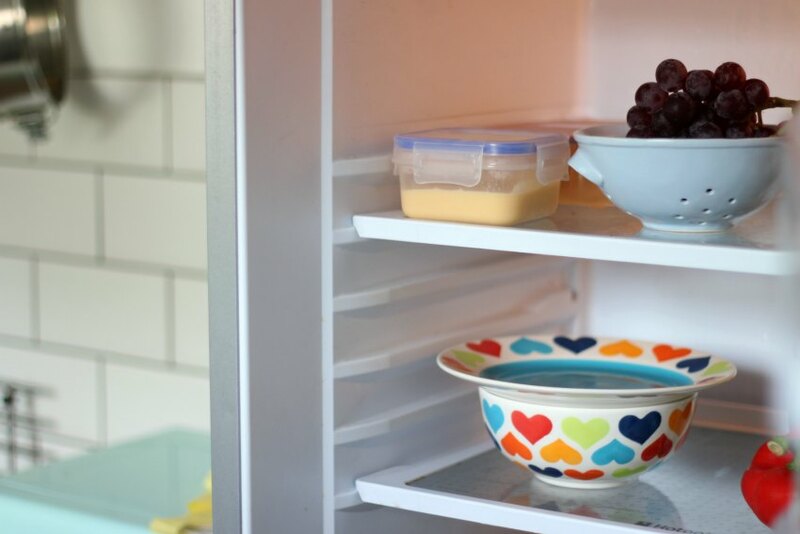 If your fridge is a bit on the full side you can even balance things on top of the plate. Pro tip two! I have a fairly extensive collection of Tupperware, amassed over the years. I use these to decant leftovers in to, or to store food stuffs in the fridge that I might once have otherwise wrapped in clingfilm, such as a block of cheese, a half chopped onion or something similar. I’m planning to replace my plastic tupperware with glass tupperware as it breaks. The best glass tupperware I can find is by Glasslock. You can put the glass trays (without the lids) directly in to the microwave and oven (up to 230°C), they won’t stain if you put tomato based foods in them, the glass is super strong, and apparently they are 100% airtight and don’t leak either. They are even freezer safe, and just sound a lot more durable than plastic tupperware. Glasslock isn’t currently widely available in the UK – it’s available on Amazon* and I saw it on offer at Costco last week for £18 too. As well as Tupperware I also use glass jars to store food in, rather than wrapping some cling film over a bowl. Leftover soup lends itself to being stored in a lidded jar quite nicely. And if you want to take the soup to work the next day for lunch the you can just cart your soup to work with you in your bag – no spills! My partner makes us homemade pizza each and every Friday. If you’ve ever made dough before, you’ll know this means making the dough and then leaving it to rise someplace warm for a few hours. Instead of wrapping the bowl with cling film, we cover the bowl with a clean dry tea towel or napkin and in the summer sit the bowl on the windowsill, or in winter sit the bowl near the wood burning stove. 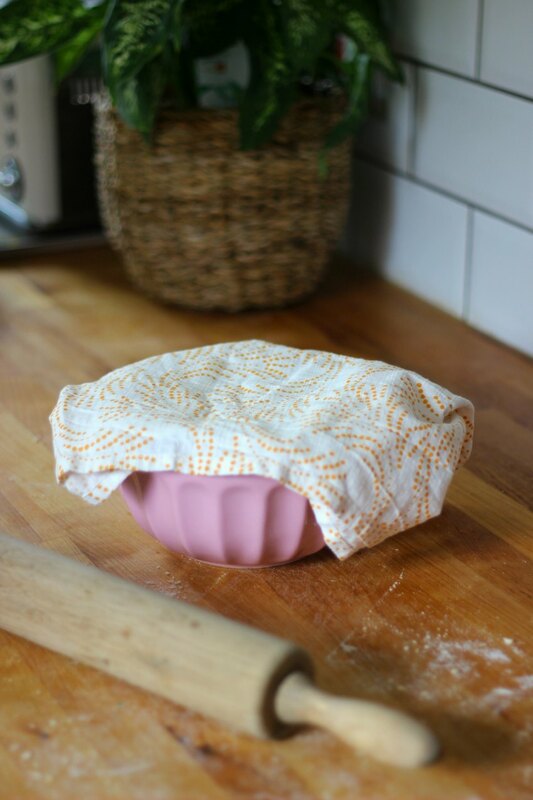 If you don’t like the idea of using a tea towel, and are a bit handy with a sewing machine then you can make these pretty bowl covers instead. If you want to wrap food up – for example a hunk of cheese – then beeswax wraps are pretty amazing eco friendly alternatives to cling film. These mould around food with just the heat of your hands and are washable. 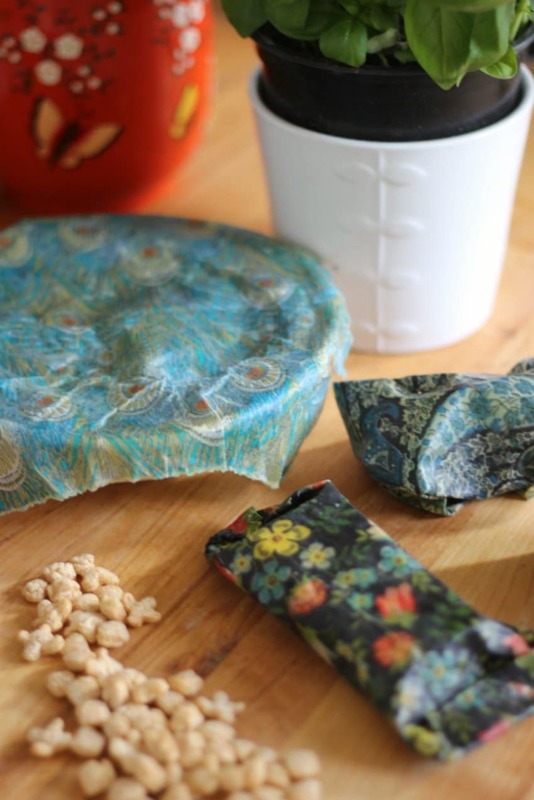 You can make your own in minutes using beeswax pellets and fabric scraps with this handy beeswax wrap DIY, or if you’re time poor you can buy them online*. A word of advice – don’t use them on hot food or on meat – instead pop the hot food or meat in a bowl and use the wrap to cover the bowl. When I think of packed lunches I ate at school I think of ham or cheese salad sandwich tightly wrapped up in clingfilm. These days I approach packed lunches a little differently. 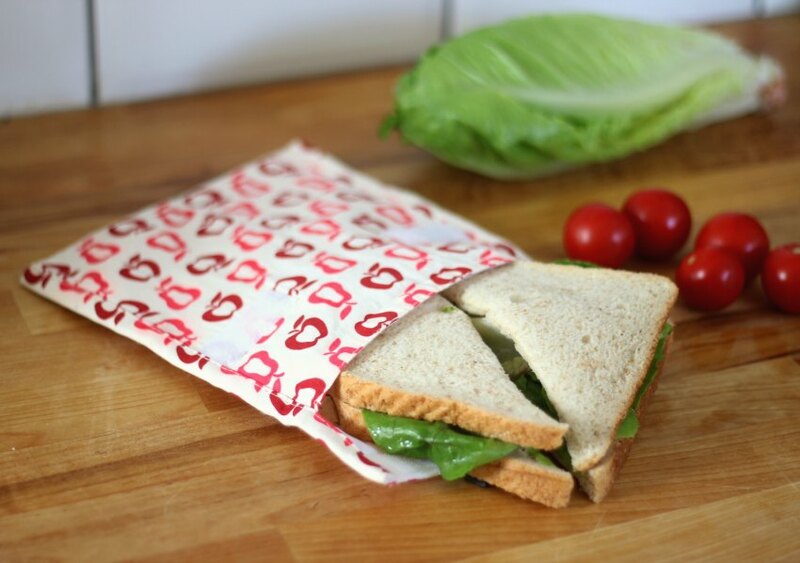 For eco friendly alternatives to cling film I have a few Keep Leaf sandwich bags* that I pop sandwiches in to, before placing them in a lunch bag. I actually bought the Keep Leaf bags as easily portable snack pouches for my daughter (got to have snacks to hand at all times!) so that I could cut down on single use plastic from toddler snacks. However I find I use them for sandwiches a lot too when we’re out and about. You can either wipe down the inside, or hand wash or machine wash the sandwich bags ready for the next use. For a no cost alternative I will also wrap sandwiches in a cotton napkin, or if I’m using a tupperware tub or lunchbox I’ll pop the sandwich straight in – no covering required. Hopefully I’ve encouraged you to give these eco friendly alternatives to cling film a go! Although I have a few things that I’ve bought, these aren’t essential. I hope the take away message here is that giving up cling film just means being creative with what you already own. And if you don’t use cling film, I wonder – have I missed any tricks? When using a tea towel for covering bread dough if you use one made fron linen it won’t stick. Don’t know why but it works. Great tip Chris! Thank you! Can I please ask a question about the bees wax covers, Can you use them in the frezzer? or if not have you any ideas what you can use instead of cling film. I love to bake and sometimes make batches if I know Im going to be to busy to bake at the weekend. Ive always wrapped the cake when cold in cling film and put into the freezer. looking for a more eco alternative. Hi Karen, you can freeze beeswax wraps for the short term – for up to one month. Otherwise greaseproof paper might do the trick? I’m pretty sure it’s compostable but you might want to double check. Great reminder! I’ve been gradually weaning myself off the stuff – it’s just about changing habits really isn’t it? I’ve re-discovered the old fashioned pyrex dishes with lids (often in charity shops!) as they’re great for storage and for microwaving without film! Brilliant post thank you! I’ve looked at alternatives before but they all seemed very expensive or impractical. We already use very little cling film and I use the plate on bowl trick all the time! But these are very useful, think I will be investing in some glasslock and Keep Leaf sandwich bags! Thanks for this post. When you just start looking at reducing, cling film seemed hard to give up ( like kitchen towel), but in reality alternatives are all really simple and cheap. It feels more like a bad habit now ( that I still resort to at times), but that I believe I can beat when I stay more aware of using it. Thanks for this brilliant post – so helpful. Am keen to buy the glasslock, but they are so expensive too! I guess you only buy once (or twice, depending on how many you need) but even so… I bought some Who Give a Crap TP with a special discount; don’t think I would have done otherwise. Still, it’s good to know the options. Information is power as they say! Thanks! am busy making my beeswax covers as I type – they are in the oven at the moment!! I wonder about using a replacement for reheating food in the microwave? Clingfilm provides a good steam environment to cook green veggies quickly and healthily. Is there a good recommendation to replace it here? I heard a paper towel can do the trick, but it’s is also single use and usually comes wrapped in polythene! Would a tea towel work well? This is a brilliant post (even if I’m a little late to the party). I have a question: I’m a vegetarian but my husband isn’t, so he buys enough fresh meat at the butchers to last him a couple of weeks and freezes it. He’s a big fan of convenience and isn’t too pleased that I’ve stopped buying plastic food bags. Do you have any suggestions for a way to store raw meat in the freezer that is convenient to use and to see what things are, doesn’t take up loads of space in our little freezer and is hygienic enough for things like raw chicken? I’m stumped – thanks in advance! Hi Sarah, I’m vegetarian too, so don’t store raw meat, but maybe something like these Stasher bags might be what you are looking for: https://amzn.to/2OKs4Jh? I haven’t tried though so can’t say for sure!